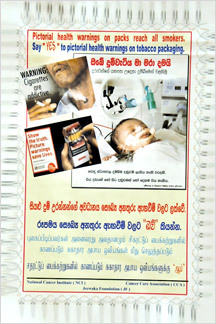 Chairman, NATA, Professor Carlo Fonseka and President, Cancer Care Association and Director Jeewaka Foundation, Dr. Samadhi Rajapaksa holding a replica of Pictorial Health Warnings on a cigarette packet. 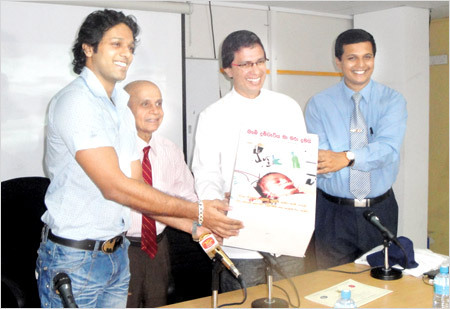 Deputy Minister of Health Lalith Dissanayake, NATA Chairman, Prof. Carlo Fonseka, President of Cancer Care Association and Director of Jeewaka Foundation, Dr. Samadhi Rajapaksa and film actor Roshan Ranawana holding a replica of the pictorial health warning on a cigarette packet. The World No Tobacco Day is commemorated on May 31, 2013 under the theme, "Ban tobacco advertising, promotion and sponsorship" by the World Health Organisation. Tobacco claims a large number of lives every year in the world including Sri Lanka. Around 39 percent of males smoke cigarettes while nearly two percent of females are addicted to this habit. Smoking affects the entire body causing a large number of diseases (NCDs) - almost all the NCDs, according to the National Authority on Tobacco and Alcohol (NATA) sources. The Health Ministry has also organised an awareness program tomorrow (27) at BMICH under the patronage of Minister Maithripala Sirisena in line with the World No Tobacco Day. Minister Sirisena will also be acknowledged and appreciated for his yeoman service extended to control the use of tobacco and tobacco related products, according to a spokesman attached to the Health Ministry. In Sri Lanka around 60 deaths are reported per day due to tobacco related diseases, which is over 10,200 per year. Six million people in the world untimely die each year. If the current trend continues, one billion people will die from tobacco use by 2030. Tobacco is deadly and highly addictive, though this epidemic is entirely preventable, the sources said. Tobacco use is responsible for causing diseases in the entire system in the body. On average, smokers die 13 to 14 years before non-smokers. Non-smokers are also affected through inhaling the fumes of irresponsible smokers. Through passive smoking they may become more susceptible to respiratory problems like asthma and various infections of the throat and nose. There is also a higher risk of sudden infant death syndrome, the sources pointed out. Some of the proposed pictorial health warnings for Sri Lanka. Tobacco smoke contains more than 4,000 harmful chemicals like nicotine, tar, formaldehyde, benzene, carbon monoxide, and hydrogen cyanide most of which are responsible for causing cancers. And given its high content of nicotine, tobacco users become addicted to the product. Some people have the habit of chewing tobacco frequently, while most people practise cigarette smoking. Both the forms of tobacco use cause many dangerous health problems. The teenage group is the most vulnerable group to get conditioned to tobacco industry promotions and initiate smoking. The teenagers get conditioned to tobacco use through peer pressure as well. It is never too late to quit smoking and a strong willpower will help you do so. Always remember, there should be no compromise, when health is concerned. Everybody should get detached from this lethal, but legal product. Besides the sources said that the best campaign which the World Health Organisation did was the establishment of the Framework Convention on Tobacco Control (FCTC) - the first public health treaty in the world, in 2005. Sri Lanka is a Party to this important treaty. WHO has identified six actions to reduce tobacco consumption in the world such as Monitor tobacco use and assess the impact of tobacco prevention policies, protect people from secondhand smoke, offer help to every tobacco user to quit, warn and effectively educate every person about the dangers of tobacco use through strong graphical pictorial health warnings and sustained mass media public education campaigns, enact and enforce comprehensive bans on; Tobacco advertising, promotion and sponsorship and raise the price of all tobacco products by increasing tobacco taxes. Model cigarette packet containing PHW. A comprehensive ban of tobacco advertising, promotion and sponsorship on tobacco products is required under the WHO Framework Convention for Tobacco Control - FCTC for all Parties to this treaty within five years of the entry into force of the Convention for that Party. Evidence shows that comprehensive advertising bans lead to reductions in the numbers of people starting and continuing smoking. Statistics show that banning tobacco advertising and sponsorship is one of the most cost-effective ways to reduce tobacco demand and thus a tobacco control "best buy". Comprehensive advertising bans on tobacco products can be achieved by following the international best practice standards outlined in the Guidelines for implementation of Article 13 of the WHO Framework Convention on Tobacco Control (WHO FCTC). To be effective, bans must be comprehensive and apply to all types of advertising, promotion and sponsorship - both direct and indirect. Comprehensive bans on advertising, promotion and sponsorship must be periodically updated to take account of innovations in industry tactics and media technology. Measures should also be put in place to severely restrict tobacco imagery in entertainment media such as films and television. Tobacco industry invests in sophisticated branding to promote their products. In many low and middle-income countries, more than a third of young people own an object with a cigarette brand logo. Prohibiting the use of tobacco branding on clothing and other items can counter this powerful technique, NATA sources said. It is also important to prohibit free giveaways of tobacco and related products. The tobacco industry frequently engages in activities that they categorise as 'corporate social responsibility' (CSR), including sponsorship of research, charities and community projects. CSR is intended to improve the image of tobacco companies as socially acceptable economic contributors and persuade governments not to implement policies that may reduce tobacco sales. Bans on this form of promotional activity are another important part of comprehensive tobacco control. People have the right to live free from harm and protect themselves from addiction to smoking. 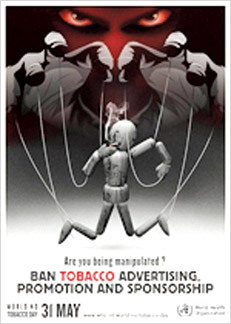 Sri Lanka has already implemented a comprehensive ban on tobacco advertising. But we observe frequent violations being exerted on the influence of the tobacco industry. The industry is increasingly aggressive at prohibitions on marketing activities that are designed to reduce tobacco use. Therefore comprehensive bans on advertising, promotion and sponsorship must be periodically updated to take account of innovations in industry tactics and media technology. Australia became the first country in the world to mandate plain tobacco packages - free of manufacturers' logos, colours and other brand imagery, and dominated by graphic health warnings. The tobacco industry immediately launched challenges, in both national courts and at the World Trade Organisation. Sri Lanka too is faced with litigation in regard to implementation of Article 11 of the FCTC - which is implementation of Pictorial Health Warnings on tobacco products. We believe justice should be to protect human lives, and not for man slaughtering. The behaviour of the tobacco industry clearly proves how much they are afraid of implementing pictorial health warnings and the industry itself knows that both the wise and the least wise categories in the society would never think of keeping a cigarette between their lips when the regulation on PHWs are implemented. 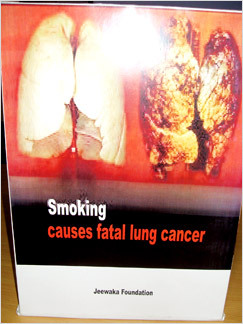 Let us look forward to seeing that Great Day - to see pictorial health warnings on tobacco products by the producers of tobacco which is a requirement to complete a comprehensive advertising ban (ban tobacco products at Points of Sale).